When the director of a specialist construction consultancy in Coventry popped into Currys to get a camera – he didn’t expect to emerge with a new member of staff! Adil Munir runs Rubix Consulting, a civil and structural engineering consultancy, from the University of Warwick Science Park’s Business Innovation Centre in Binley. The company specialises in designing and checking temporary works for building and civil engineering projects. Temporary works can include high-risk items such as tower crane foundations that often warrant the skill and attention of a specialist engineering design consultancy. The firm originally moved into the Science Park under its Ignite programme which offers micro and start-up companies a range of business support, mentor and a furnished office on a sliding rent basis to help them get off the ground. 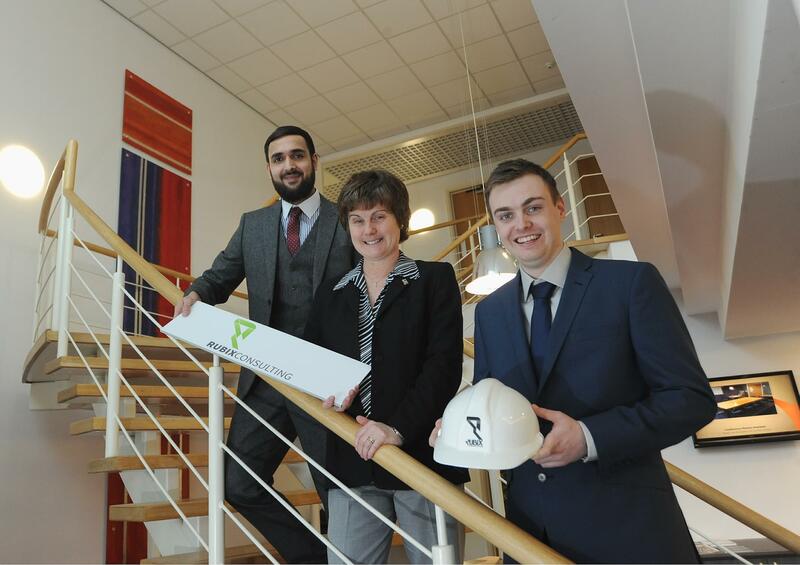 Such has been Rubix’s success in the space of a year, after winning contracts with some of the major players in the construction industry such as Galliford Try, Carillion and Shaylor Group, the firm has expanded into a larger unit at the Business Innovation Centre. On top of that, the company is growing its team and has added Sam Kerr on a year’s placement to help continue Rubix’s expansion. Sam, who is studying Civil Engineering at Coventry University, had been working in Currys to help supplement his income when a chance meeting with Adil paved the way for his new role. Adil said: “I was on my way to look at a site in Coventry and wanted to take some photos of it to help me when I came back to the office to quote for the project. “I popped into Currys and a helpful man came over and asked if I needed any assistance. I told him I was looking for a camera and when I told him what I wanted it for, his eyes lit up and he told me what he was studying at university. “We got chatting and I told him we were looking to recruit someone on a year’s placement and that he should get in touch. He added: “We are excited by the level of growth we have achieved in the early stages of the company. We anticipated that medium-sized contractors would be our biggest market but it’s turned out that, with so much development taking place, a lot of the bigger construction company’s own temporary works departments are needing to outsource some of their work. Penny Robb, the manager of the University of Warwick Science Park’s Business Innovation Centre, said that Rubix proved how a little bit of support can go a long way. She said: “Without the help of Ignite, Rubix wouldn’t have been able to get off to such a flying start.